Well, my Facebook homepage changed this afternoon and I assume everyone else's did too. What do you think of it? I think it's grand. People will get used to it, as they did the bigger revamp a few months back. Not sure it was needed though. Apparently ther's only a small unfortunate test group whose page has changed. I don't like it. I was comfrotable with the old one. I don't like change. I want my olf home page back. I don't really mind; this new design looks cool! 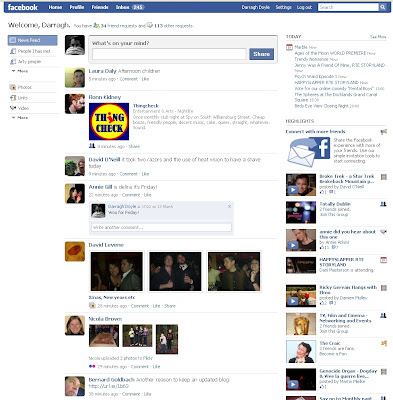 I prefer Facebook over the new Twitterbook. I want the old page back. The only thing I like about this one is the rounded corners for the people photos. I'm a sucker for those. Otherwise, if it ain't broke, why fix it? Mine changed over the weekend. Navigation on the site has improved alot. You can also now use your webcam directly with Facebook and upload pics, not that useful I guess. As a self confessed luddite any change unsettles me; it has taken me so long to get used to the original format that this constitues a serious setback!